I am free to run. I am free to dance. I am free to live for You. Yes I am free. Lately, God has been speaking a lot to me about freedom in Christ. You see by nature I am a “rule follower”. Some of us in particular really respond to rules and grades and times ect when they affirm us. We want to be affirmed because we are “worthy” of affirmation. God wants us to find affirmation in what He’s done for us through Jesus as opposed to the “good” we’ve done. One thing I often struggle finding freedom in is pleasure. Satan takes a little truth, like “we are not here for ourselves” and turns it into “therefore you can not enjoy anything for yourself”. That is simply not true. God created pleasure and within the context of honoring him he wants us to enjoy life. This doesn’t mean he wants us to enjoy the pleasures of sin, absolutely not. But he has created many things specifically for our pleasure. I won’t get to deep into all that though, let me get to my point. I enjoy running. I enjoy the time outside, the activity, the many moments I have with God or with a running buddy, the times I worship through music while I run, or the times that its just wonderful being by myself. Running is not only fun to me, its also a healthy outlet for me. Its also quite a metaphor to my Faith. Sometimes I do get sucked into the “performance” of running, and there are other moments that I feel guilty about enjoying it. I know that sounds silly and maybe even foreign to some. Guilt does not come from God though. Neither does performance based Faith. God recently used running as a tool to teach me more about freedom. I was going into this race with a fresh attitude and a bit of experience. It’s pretty typical of me to be an over achieving perfectionist and God is working in me to break free from that. 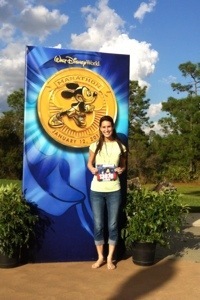 On Sunday January 12, 2014 I was running in the Disney Marathon. You always have goals with races. My problem is I tend to bind myself to them allowing little room for adjustments if necessary. You commit, you plan, you train. Of course I tried to stick to my plan but I also cant allow my plan to rule life. This is all part of the freedom exercise. It can be a struggle for me to balance! 🙂 My training really got tossed to the side amidst the move and holidays and not to freak anyone out but I tested positive for strep the Tuesday before race day. I had the “go” from my doctor, don’t worry. As with life, so with running. Training is good and planning is good. But you never know what is going to happen so when the curve ball comes you do your best to glorify God with where you are at. Running for me is: to enjoy the abilities God has given me. He created me, he enables me to run, and he is pleased when I can run freely, unconcerned about expectations or affirmations, just embracing this gift that comes from Him and being content with His pleasure alone. Letting go of my expectations was what made this race so incredible. Disney blew me away with the phenomenal job they did organizing this event. I wish I could write the event planners, volunteers and every person who cheered thank you notes! They were awesome! 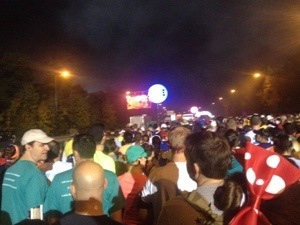 There was elaborate sets with Disney characters all through out the race. Runners were stopping and getting pictures taken and riding rides even! We saw behind the scenes and went through the parks and resorts. It was so entertaining and exciting! In some areas I did feel more prepared this time just having a general idea of “what to expect”. It was fun having Mike, Jason’s brother, around. This would be his first marathon. He was game for anything! 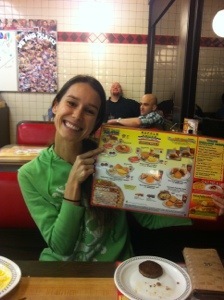 Like getting up race day at 3am and going to Waffle House for breakfast. The All Star breakfast, totally living up to its name! Oh meanwhile these guys photo bombing, they were just finishing up from the club. They were quite the crack ups! 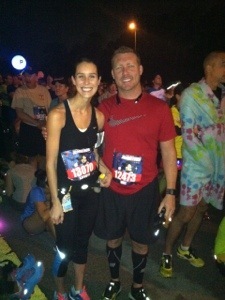 We definitely were carbed up and I felt great through out the run in terms of nutrition. We did have our moment of panic when, I kid you not, we got lost trying to get to Epcot. Don’t ask me how this happened. We gave ourselves 70 minutes to get there. Our hotel was only 5 miles away. Somehow we made it to Animal Kingdom twice though haha! We literally parked and ran up to the check in just in time. It was not funny at that moment but I am sure we will laugh about it for years to come. My mom always reminds me of this quote. I really was focusing on Him. The thought that I bring him pleasure even when I am running, that thought was very freeing. With 1.2 to go I was listening to The Great I Am. Because of you God, the Great I Am, I am free to run. I am free to live for you. I am free. I got to the final stretch and unplug to see if I spot my family. There are so many people and they are all smiling and cheering! I hear Jason and my mommy in law and Jessica all screaming “KATIEEE!! 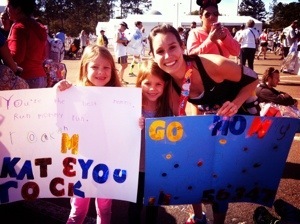 !” And my girls with their homemade signs. I was so excited! 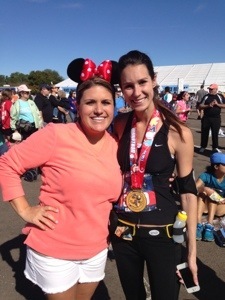 I picked up my legs as much as I could and crossed the finish line smiling this time! I finished hard and strong with my hands raised truly in awe over the One who brought me there. Because my strength, both physical and mental, is from Him. Any runner will tell you that running is very freeing. A lot has happened over the last year and I think it’s really beautiful that right now what God is speaking to me about is freedom. 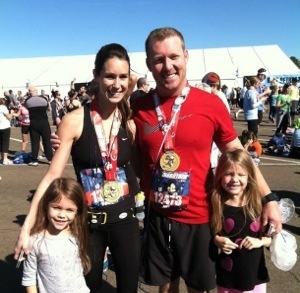 I can’t end this blog with out congratulating Mike on doing so well in his first marathon. Super proud of you brother! I also have to put it out there that I am so totally grateful for my husband Jason. 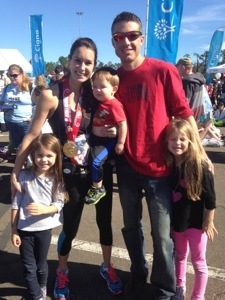 He encouraged me to run another, he signed me up for probably one of the best, most expensive races, (which y’all know that says A LOT about how much Mr. Frugal loves me hehehe 😉 $$$) and than he supported me through 18 weeks of training, watching 4 kids while I ran, running a business, moving, and everything else life brings. And he did it mostly with a fantastic attitude. 😉 I can’t thank him enough. I feel loved and cherished by his sacrifice. God is working on both of us about letting go! Jason, you’re not just “the” man, you are my man!